Ohioans For Concealed Carry Discussion Forums • View topic - Fix NICs Act..
Yeah, pretty clearly contrary to the First Amendment. Some of us believe in the whole Bill of Rights. I believe you found that quote here under point 5. Hamilton Abert Long believes that what he has stated gives rise to the entire Bill of Rights. He's laying the philosophical foundation for the 1st Amendment and others. He's displaying the well, where the Liberties we enjoy spring from. He finds no contradiction in binding Congress from making an official religion (as this was the reason for fleeing their former Homeland) and believing in a Law-Giver outside of humanity. In fact, he insists on both. In fact, the insistence is what runs afoul the First Amendment. Exactly. It is the same insistence which governs the Islamic State. It's not the merger of State and Religion. It's a one way street. Perhaps this analogy will help: A boat is to be in the water, but water is not to be in the boat. Similarly, religion will permeate the State, though the State should not permeate religion. The question is which religion will permeate the state, and what will be the high power past which there is no appeal? Art 3. Religion, morality, and knowledge, being necessary to good government and the happiness of mankind, schools and the means of education shall forever be encouraged. 1st Amendment, though, is not much of an argument. Referencing the Islamic State is simply silly. Where is the security for property, for reputation, for life, if the sense of religious obligation desert the oaths which are the instruments of investigation in courts of justice ? The freedom to choose one's belief includes the right to choose non-belief. Would you then make it a criminal offense not to believe in a higher power? schmieg wrote: The freedom to choose one's belief includes the right to choose non-belief. Would you then make it a criminal offense not to believe in a higher power? Of course not. That would be antithetical to the concepts I'm supporting. "You have an inalienable right under the First Amendment not to believe in God or a Creator." made earlier is contradictory as unalienable Rights flow from a religious philosophical presupposition. That the belief in the concept of unalienable Rights is a product of religious belief that gives rise to the 1st Amendment (and others). 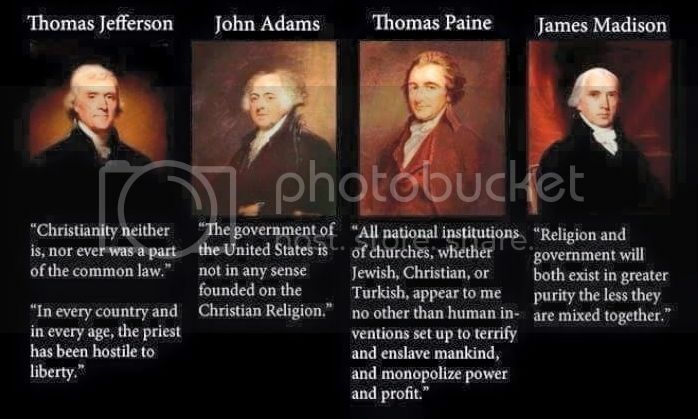 To divorce the concept of unalienable Rights from Religious belief in the supremacy of spiritual matters is antithetical to the concept of Liberty as expressed in the founding documents of the nation. That without a spiritual religious philosophy underpinning justice, all declarations are mere preference, such as cuisine- carrying no moral OUGHT. 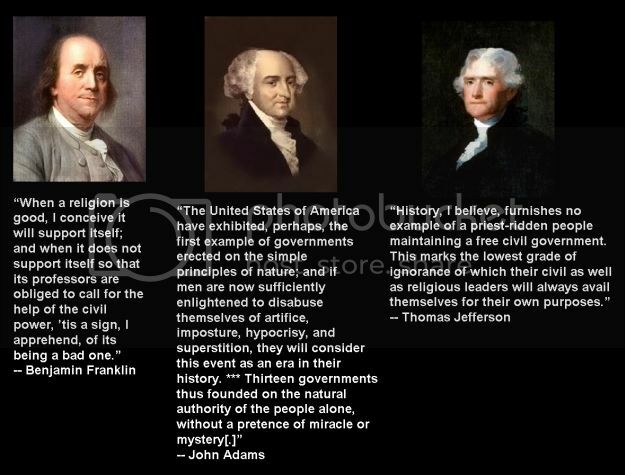 Whereas This Religious Belief gave rise to the legal concept of Natural, preexisting, unalienable Rights in many realms, particularly regarding religious belief. Resolved, There Shall Be no Government compulsion to individual belief in a particular religion. Rights are not inherent to belief in, do not require belief in, and do not originate from religion or even in some higher power. Rights are inherent within the individual by virtue of simply being human. Every individual has the rights outlined in the BoR and infinitely more. The BoR does not grant the individual anything; it tells Government where it may not tread. Governments and other individuals may infringe upon the rights of others and prevent them from exercising those rights but those rights still exist; they can not be legislated away. My rights are not dependent upon anyone else's belief in the Flying Spaghetti Monster, Zeus, or any other deity. The First Amendment is the argument. You have a right to believe as you wish and to govern your life by those beliefs. You have zero right to expect others to adopt your beliefs, to have the government enforce your beliefs, or to deny a claim of patriotism by those who do not share your beliefs. This would be like it being a criminal offense to not own a gun due to the Second Amendment. Maybe he's on to something here. I hope you'll excuse me for not being swayed by a compilation of un-sourced, out of context "quotes". Who said anything about government enforcing my beliefs, or expecting others to adopt my beliefs? (Shoot the messenger, make it about him)This is what the Pilgrims fled. They didn't like the government overrunning the church or compelling belief. Chris Tucker? "Well aware that the opinions and belief of men depend not on their own will, but follow involuntarily the evidence proposed to their minds; that Almighty God hath created the mind free, and manifested his supreme will that free it shall remain by making it altogether insusceptible of restraint; that all attempts to influence it by temporal punishments, or burthens, or by civil incapacitations, tend only to beget habits of hypocrisy and meanness, and are a departure from the plan of the holy author of our religion..."
Somehow, Jefferson could hold these two concepts concurrently: That Liberty is a gift from God and that government should not compel belief. Some would dispose of the former although it births the later. So one who has no belief in a god can come to the conclusion that government should not compel belief? They CAN, but they won't be able to argue for that conclusion on their own worldview (they'll borrow from religion eventually, undermining their declared disbelief). Without a "Great Legislator" or a transcendent view of justice that exists outside of time and above humanity, the debate comes down to mere preference. Why should messenger A's preference be greater or lesser than Messenger B's? So while people CAN argue the different appeals of flavors of ice cream, the discussion carries little weight. Why is anything wrong if there is no such thing as justice? However, when you declare freedom self-evident via birth by decree of your Creator, personal preference (your own or that of another) is rather moot. The controlling principle isn't within humanity's ability to legislate, corrupt, or vote upon. My opinion on the right of Expatriation has been so long ago as the year 1776. consigned to record in the Act of the Virginia code, drawn by myself recognising the right expressly, & prescribing the mode of exercising it. the evidence of this natural right, like that of our right to life, liberty, the use of our faculties, the pursuit of happiness, is not left to the feeble and sophistical investigations of reason but is impressed on the sense of every man. we do not claim these under the Charter of kings or legislators; but under the king of kings[.] if he has made it a law in the nature of man to pursue his own happiness, he has left him free in the choice of place as well as mode: and we may safely call on the whole body of English Jurists to produce the map on which Nature has traced, for each individual, the geographical line which she forbids him to cross in pursuit of happiness. it certainly does not exist in his mind. where then is it? I believe too I might safely affirm that there is not another nation, civilized or savage which has ever denied this natural right. I doubt if there is another which refuses it’s exercise. I know it is allowed in some of the most respectable countries of continental Europe; nor have I ever heard of one in which it was not. how it is among our savage neighbors, who have no law but that of Nature, we all know. Here Jefferson is providing a basis for the moral OUGHT that is the foundation of his belief. Without this foundation, I'm not certain how one asserts much of anything regarding Liberty, Life, the nature of man, etc. Jefferson calls this attempt "the feeble and sophistical investigations of reason". Clearly, some have always been willing to make the attempt. Jefferson (in previous quotes) said that men can't be compelled by government to think one way or another... or at all, I suppose. It is folly to use force to compel thought. Meanwhile, back at the ranch, it looks like the House Judiciary committee is scheduled to do markup on this bill along with the national reciprocity bill tomorrow at 10:00 AM. Supposedly there's a way to watch online. Hopefully I can figure that out and work it in around my business meetings. djthomas wrote: Meanwhile, back at the ranch, it looks like the House Judiciary committee is scheduled to do markup on this bill along with the national reciprocity bill tomorrow at 10:00 AM. Supposedly there's a way to watch online. Hopefully I can figure that out and work it in around my business meetings. The antis are having a field day. Strong showing of speeches from the (D)s and lots of red MDA shirts in the front row of the gallery. Reps Nadler(NY), Cicciline(RI), Lofgren (CA), Deutch (FL), and Jackson Lee (TX) are leading the overall resistance. The red shirt moms are looking grumpier and grumpier each time they show the clerk calling the roll. High capacity mag ban defeated. Two fewer moms in the audience and those left seem to be playing candy crush on their phones.